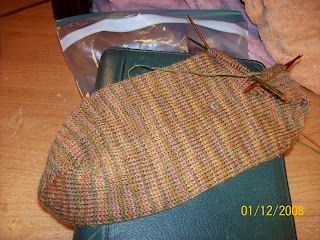 So, there's the new sock - with the heel just completed. Some ankle rows and then a ribbed (2 x 2) leg and the first one will be done. The yarn is Schaefer Yarn "Anne", 60 % Merino Wool Superwash, 25% Mohair and 15% Nylon - I bought it here. I think I bought way too much yarn: each skein has 560 yards in it and I bought two skeins. (I have BIG feet, so I'm always paranoid about not having enough yarn...) I'm more than half way through this first sock and the first yarn-cake (one skein) still seems pretty hefty. I'm knitting these socks on size 2 (the larger size 2) Harmony Wood dpns. Did I say how much I love Harmony Wood needles from Knit Picks? On a completely non-knitting subject, above is a picture of Clem, my new Puppy Dog. (We just got him the weekend before Thanksgiving.) I used to have a half-scottie dog named Annabelle. When she died a few years ago, I knew that someday I wanted a lap dog... In the meantime, we baby-sat several big dogs for various friends of our kids, and when the latest one went back to her family, I began looking in earnest for "my" lap-dog. I haunted the local Humane Society and read the classified ads religiously. No small dogs at the Humane Society (over a period of several months) and all the dogs/puppies in the paper were way expensive. 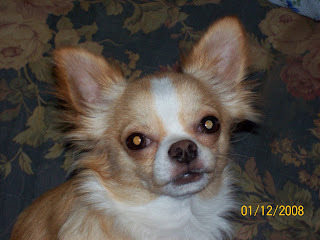 Then, there was an ad for a seven-month old Chihuahua for $100...I hadn't thought that I wanted a Chihuahua, but I thought "Why not? I'll just go look." Well, when the lady brought Clem out to meet me, I just fell plumb in love! It turned out that she had a kennel and raised long-haired Chihuahuas, and then her geographical area got annexed into a nearby community and that community doesn't allow kennel licenses. She had to either move (in a ridiculously short time) or get rid of all her dogs but three... The seven-month-old in the newspaper ad was already gone, but she still had Clem left and, like I said, I loved him at first sight. He is a character - the heart of a lion and the bladder of a Great Dane. When I take him outside first thing every morning, his first pee lasts a very long time! He is fiercely protective of me - to the point that he doesn't like it when DH gives me a kiss! And, DH wants to play and cuddle with Clem, but Clem won't have anything to do with him. I'm hoping Clem will mellow out in time. Yesterday I gritched about the weather - all that melting and dripping. Well, today our back yard is nearly free of snow and I swear there's new green grass out there! The birds have been numerous and noisy all day! Our neighbor's back-yard Oak trees and our Ash tree have been full of robins all day and our Juniper "Bird Tree" has been so noisy that you can hardly hear yourself think when you go out back. I hate to say it, but I'm thinking Spring - and I know better! January is, after all, a six-month-long purgatory, where Spring is too distant to even dream about.